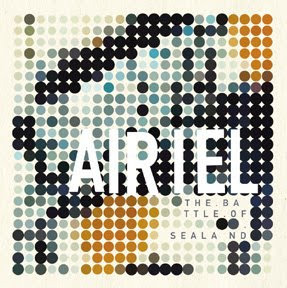 Jim DeRogatis of the Chicago Sun-Times recently deemed local noise rock outfit Airiel one of "Chicago's next big bands," and a listen to the group's 2007 release, The Battle of Sealand, reveals more than a few moments that prove why. Airiel is known as a shoegaze band, and it's true that the music is fuzzed-out and full of noisy guitars. However, there's nothing subtle about The Battle of Sealand. The band goes all out, spares no sound effect and really, truly rocks. Even the vocals of Jeremy Wrenn, while often indecipherable, hold their own against the wall of noise on many tracks. Thinktank, Thrown Idols, Mermaid in a Manhole and The Release are driving workouts that take a much more aggressive approach than an unsuspecting listener might anticipate. Sugar Crystals is an icy electro jolt that sputters along fueled by nervous energy, and while the yearning Stay offers a rare chilled-out moment, it also manages to maintain the album's overall sense of urgency. The Battle of Sealand arguably approaches tedium during two tracks - You Kids Should Know Better and The Big Mash-Up. While these songs aren't devoid of any redeeming qualities, they make the Battle go on a little longer than necessary.